It is important to understand some rules of thumb when it comes to working with concrete. The first and most obvious concept in these “guesstimates” is that concrete is heavy. Standard concrete is created from rock, sand, and cement, all of which are naturally heavy materials. There has been published rules of thumb for understanding the weight of concrete, but we wanted to do some checking of these numbers for ourselves. We made several calls directly to ready-mix producers around the country and found that 1-yard of standard (5-sack) concrete weighs between 3690 and 4010 pounds. The weight varies due to the aggregates that are mined and used in the area where the concrete is produced. 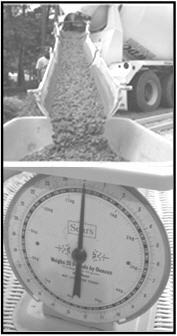 The weight also changes as more cement is included in each yard of concrete mix. We learned that some of the heaviest standard concrete is produced in Northeastern Washington. A common recipe for a standard concrete mix design includes 5 bags of Portland cement for each yard of aggregates. The cement is measured in 94-pound increments or bags. Five bags at 94lbs equals a standard cement weight of 470 pounds per yard of concrete. So here is the rule of thumb that we share with our customers: 1-yard of 5 sack concrete will weigh about 3850 pounds or 143 pounds per cubic foot. We use this 3850-pound guesstimate so that our mixing trailer customers can figure the towing weight of a full trailer. For example, if a 1.75-yard capacity MixKing trailer weighs 2700 lbs empty and it is filled with 6737 lbs of standard concrete (3850 X 1.75), then the total towing weight is 9437. These calculations help customers to determine the size of the ruck needed to tow the materials to the job site. And since the MixKing trailer is rated as a 10,000 GVW trailer, it will have no trouble handling even the heaviest concrete mixes. A modern heavy half-ton pickup truck will have the towing capacity to pull a full MixKing trailer down the road. You can also use this rule of thumb when shopping for any concrete mixer. Knowing weights can ensure that you are purchasing equipment that is strong enough to mix the volumes that you desire. Happy mixing!